Many thanks to Sam Fiorella, of http://www.denmarktheagency.com/ and sponsors http://www.cbeyond.com/ for last week’s "Social Media Squared" seminar in Denver. The long day was chock full o’ tips and techniques. But mostly, I appreciated the changes in mindset being forced upon American business by the wide open social media culture. I liken the current transition from “old PR” to “new PR” to the difference between learning styles. Consider the difference between room dynamics in a lecture (“I’m the expert. Shut up and listen.”) and a more interactive symposium (a learning environment in which the attendees are expected to share their expertise). In fact, sharing (give and receive) is a cardinal ethic in the social media universe. At the University Pittsburgh’s Cathedral of Learning, 26 world renown “Nationality Classrooms” depict the different learning styles employed around the world. 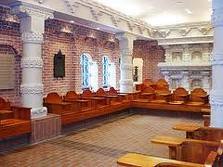 We are generally familiar with the ornate, forward-facing, “professor knows everything” layout of the Norway classroom. The beautiful Indian classroom, also ornate, orients the students’ desks facing each other. In this design, a “shared” learning experience is encouraged. • Note the transition from “one to many” (broadcast) to “one to few” (database, e-blasts) to “one to one” (super niched, highly targeted, almost personal communications). • Case study: Boston restaurant blogs recipes and videos for foodies, sees 30% rise in sales a year later. • In the “Social Media Ecosystem,” healthy organisms feed each other.